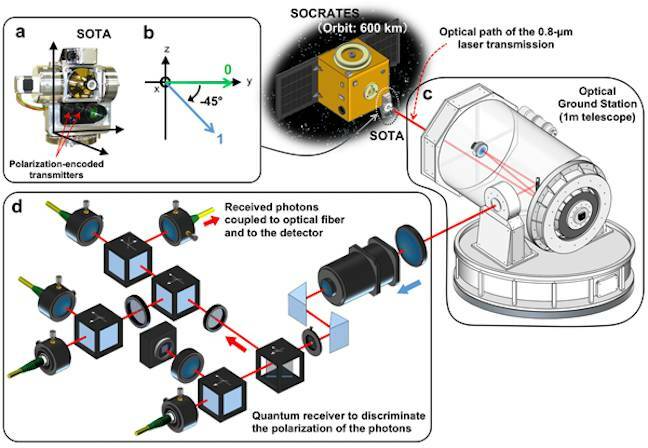 Japan has become the latest country to demonstrate quantum communication with a satellite, in this case a micro-satellite named SOCRATES. The National Institute of Information and Communication Technology (NICT) announced the quantum key distribution (QKD) test, which showed off the capabilities of its SOTA quantum communication transmitter. SOTA encoded ones and zeroes onto the polarisation of light, firing them at the NICT optical ground station in Koganei at the rate of 10 Mbps. At the receive end, only one in ten pulses yielded up a photon (at least, that's what Vulture South assumes the NICT's announcement is describing as “an average of 0.1 photons per received pulse”). A one-metre telescope received the pulses and passed them to a quantum receiver. Technology on the ground performed time synchronisation, and polarisation reference frame matching “between the satellite and the ground station”. Quantum key distribution provides a relatively low-bandwidth channel for two parties to exchange keys they can then use to secure communications over a conventional channel. Interference or interception by a third party destroys the quantum states that carry the keys. The SOCRATES satellite (Space Optical Communications Research Advanced Technology Satellite) is an 17.8 cm x 11.4 cm x 26.8 cm, 6 kilogram microsatellite launched to its 600 km orbit in 2014.